Festivity and divinity are synonymous in India. Festive India and Divine India are like two sides of a coin. It is because most of Indian festivals are religious occasions dedicated to gods and goddesses. One such festival is the Festival of Chariot or Rath Yatra which is celebrated in honor of the Lord Jagannath, the presiding deity in east India. Pouring crowds, religious fervor, ceremonious rituals, grand arrangements and aura of devotion are the stunning spectacles of this cultural extravaganza in India. Though the Chariot Festival is celebrated all over India, it is the prime tourist attraction of Puri, a coastal town in the Indian state of Orissa. 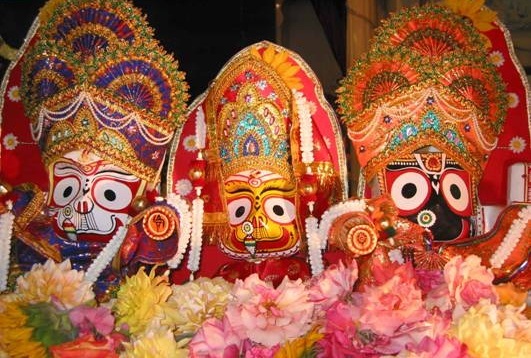 The ceremonious procession of the idols – Jagannath, Subhadra and Balabhadra – on three colossal, embellished chariots from the Puri Temple to the Gundicha Temple is the biggest draw of the Indian festival offering lots of visual joy. The 45 feet high chariot of Lord Jagannath is pulled on 18 wheels by hundreds of devotees. It is said that the custom of pulling chariots with the idols is a Buddhist tradition. The similar mention is found in an account of ancient India, written by Fa Hien, a pilgrim from China, in fifth century AD. The British were shocked to see the waves of crowd and commotion around the chariots during the festival in the 18th Century. They were so stunned that they called it “Juggernaut” with reference to destructive force. The colossal chariots are made of wood. New chariots are constructed every year. The old idols of the deities are replaced by new ones once in twelve years. The deities are taken back to the main temple after a 7-day long stay at the Gundicha Temple. At some places in South India, to say Mangalore, the Chariot Festival is observed as a glittering celebration of the wedding of Goddess Padmavathi and Lord Venktesh. Mangalore in the state of Karnataka celebrates it in January or February. 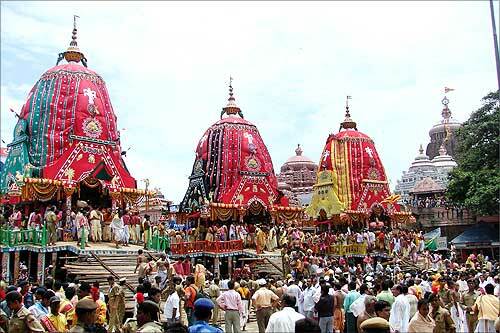 The holy chariots of Puri Temple in Orissa are different from those of South Indian temples. The topmost part of Puri chariots is covered with a large piece of colorful clothes. In South India, the chariots are adorned with flags of different colors and delicate images of different gods. The grand procession of the chariots is accompanied by several ethnic musical instruments like mridang, nagaras, drums, shahnayee, etc. The Lord Jagannath’s name is loudly chanted in chorus during the procession. The Brahmins who offer regular worship to the Lord at the temple carry the Jagannath idol in an embellished palanquin to the chariot. Tied to the front end of the chariots, the ropes are used to pull the chariots. Some devotees touch the rope while some others pull it to be blessed by the Lord. The flow of tourists to India runs high just before the Chariot Festival of Puri. Such frenzy, such excitement, such gaiety, such fervor, such crowds and such festivity in incredible India must not be missed. The beach is another attraction of Puri apart from the temple and the festival. What more? Khaja, a sweet delicacy that Puri is famous for the world over, is a must taste. The Chariot Festival of Puri is scheduled to commence on July 10 this year. Travel to India with cheap air tickets from IndianEagle.com.